It is my opinion, and that of many other business owners, that Facebook is going to be replaced by other social media sites such as Google Plus. I am a true believer in Google Plus, as there are so many ways to improve your online visibility by linking your profile, pages, YouTube channels, etc. If you are using Google Plus (compared to Facebook), it is also much easier to control who sees what. Yeah, sure, you can do some of that in Facebook, but it’s not as quick and easy to do. So when I decided to start building my Google Plus profile recently, I knew that there were ways to import your Facebook friends into Google Plus. However, it turned out not to be as easy as I had believed. So, I did a lot more researching. I saw all sorts of methods illustrating how you could import your Facebook contacts into Yahoo mail, and then into Google Plus. So I did that, only to discover that you can no longer export those Facebook contacts (that have been imported into your Yahoo mail) by a CSV file to import them into Google mail (and ultimately into Google Plus). If I missed something, and you know of a way, please let me know via the comments section below. So why am I telling you everything that did not work? So that you don’t waste your time doing things that you’ll read about or watch on Youtube that no longer work! 1. Go to Friends to Gmail. 3. Next, you will be prompted to save the file as a CSV. I named mine facebook.csv, and saved it to my desktop. 4. Now, login to your gmail account that is linked to your Google Plus account. 5. 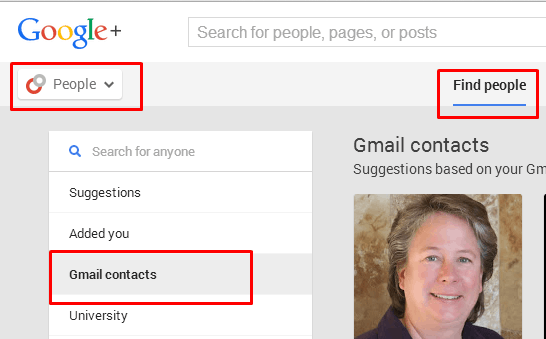 In the top left-hand corner of Gmail, you will see “Contacts.” Click on this. 6. Then scroll down the left side sidebar, and find “Import Contacts.” Click on it. 8. Your friends will be imported into Gmail! It’s that easy! But now, how do you get them from your Gmail account into your Google Plus account, and your circles? That’s easy too! Just head on into your Google Plus account. Then click on “Gmail Contacts,” and they are there. You can now add them to whichever of your circles you prefer. The only limitation I can see to this method is it will only add Facebook contacts who have gmail addresses. I’d love to hear from you if you are aware of a method of adding non-gmail addresses. I got here from our G+ group. I am so glad you posted this article and let us know. I was thinking about it as well but I did not have time to figure out how to import Fb contacts into Google+. So I am glad you took the time and decided to share it with us. I sure hope FB is not going to go. Although I am quite active there, with all the crazy changes they are implementing I have this uncomfortable feeling in the pit of my stomach that it may die. I guess they are cutting their throat. And that is too bad because I find it significantly more user friendly than Google+. Personally, I am not sure that people will embrace Google+ with as much love as they did Facebook. Marketers will learn but I just can’t see the general public doing that. I hope I am wrong.